Mango is a tropical fruit of genus mangifera. It is native to Asia such as India, Pakistan and the Philippines, and the national tree of Bangladesh. Mango contains many phytochemicals and nutrients. It also contains compounds such as pigment carotenoids and polyphenols, and omega-3 and -6 polyunsaturated fatty acids. There are up to 25 different carotenoids which have been isolated from mango pulp. The highest content is beta-carotene, which accounts for the yellow-orange pigmentation of most mango species. Mango cheeks are sliced from mango fruit. There are no additives such as colourings, sweeteners or preservatives. 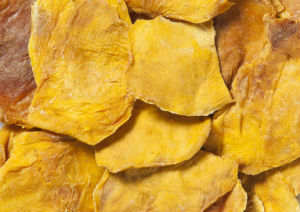 These dried mango cheeks are organic and contain no sulphur or other preservatives.